A Discovery Channel Documentary on 'The Buddha Boy Of Nepal', Ram Bahadur Bomjon or Palden Dorje who is believed by some to be the reincarnation of Siddhartha Gautama Buddha because of the many coincidences (synchronicities) which connect his life with that of the Buddha, the Awakened One ! 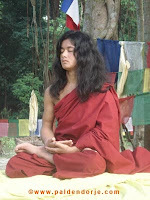 Born on Chaitra Purnima(Full moon)in 2046 B.S ( April 9, 1990 A.D), Tapaswi Palden Dorje (Ram Bahadur Bomjan)has sat for kachhen duba (severe meditation) without food or water since the 2nd of Jestha 2062 B.S (May 16,2005 A.D) until the present. He was born a Tamang, descendant of the Tamang Lamas who were renowned for their ability to go for long periods without food while receiving their prana through the practice of meditation. Legend has it that the Tamang lamas could fly and talk to trees, animals and birds. The lamas would befriend wild animals such as tigers, lions, bears and snakes and remain unharmed by them .Blessings be bestowed upon Maya Devi Tamang, mother of Tamang Tulku Rimpoche, Ram Bahadur Bomjon. She has been the means of making the people of Nepal and of the world fortunate to witness the birth of such an incarnation as only occurs once in thousands of years.